A construction building collapsed in Karnataka's Kumareshwar Nagar. More details are awaited. 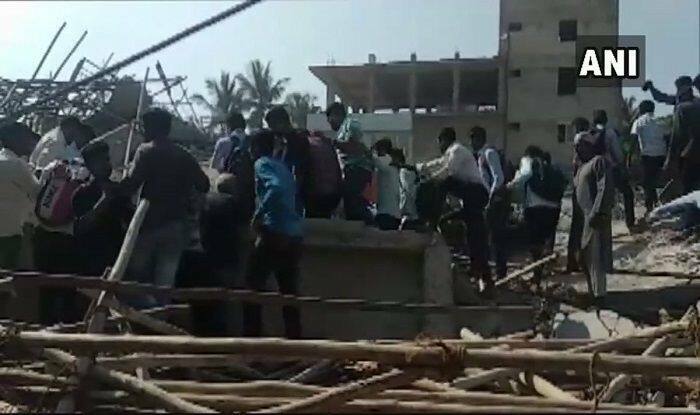 New Delhi: At least two people were killed and six injured after an under-construction building collapsed in Dharwad area in Karnataka’s Kumareshwar Nagar on Tuesday. Further, 40 people are feared trapped in the debris. All those wounded were taken to a hospital. Nearly 10 ambulances and five fire tenders are present at the spot to carry out rescue and relief operations, a News18 report said. “2 people dead, 28 people rescued & receiving treatment at Civil Hospital. NDRF and SDRF team has reached the site of building collapse. Oxygen & water given to 7 people buried in debris. Rescue operation to continue at night,” Deputy Commissioner Dharwad told ANI. “24 people have come here out of which 3 were in critical condition and were referred to KIMS Hubli. 1 person was declared ‘brought dead’, all others are being treated,” Dr Sangappa, Assistant DMO, Dharwad Civil Hospital told ANI. Basavraj Nigadi, Gangadhar Shintre, Ravi Sobrad are the owners of the building that collapsed in Dharwad. One of the owners, Gangadhar Shintre is the father-in-law of Congress leader Vinay Kulkani. The reason for the accident was not immediately known.